Well, not exactly, but at a private function in Sao Paulo, the legendary Pele apparently did call fellow Brazilian footballers Ronaldo and Robinho uhhh…coke heads. But now the former New York Cosmos forward denies the incident ever occurred. Very sneaky, Pele, very sneaky (God, I have to stop with the Adam Sandler movie references). Author D.A. 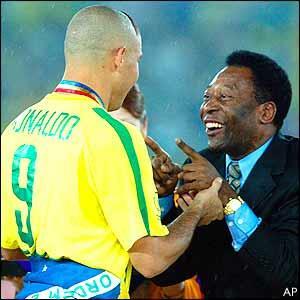 HasselbainkPosted on March 25, 2009 March 25, 2009 Categories UncategorizedTags Brazil, pele, robinho, ronaldoLeave a comment on Oh No Pele Didn’t!